Google is preparing to challenge music streaming's top dogs in Spotify and Apple Music. The keys to their new strategy are several functions that set YouTube Music apart from its streaming competition. I’ll tell you the five main reasons that led me to try YouTube Music. Images and sound belong together, and that’s been true sing long before Queen’s Bohemian Rhapsody, the first recognized “official” music video. When I want to share a song on Facebook, Twitter or elsewhere, I usually first search for a video on YouTube before looking for it on Spotify. There’s a simple reason: everyone can access YouTube, and there’s also something to see in addition to the music. That’s exactly what I expect from YouTube Music, and my first attempts with the new app make me very confident that this will work out just fine. I also think the mixture is attractive, since on YouTube you won’t just find official singles and albums from your favorite artists, but much more as well. It doesn’t matter if you’re looking for covers, live shows, or contributions from normal YouTube users. You’ll have everything at a glance. This makes it much more comfortable and exciting to search through music and videos, and you’re sure to find a few gems in there. No other company knows as much about me and my taste as Google does. So I expect YouTube Music will know my taste in music pretty quickly and be able to give me better recommendations than other streaming services. That’s still not certain, but for me it’s a great reason to give YouTube Music a chance. YouTube uploads 400 hours of video material every second, and a lot of that content is music. According to Google, all videos that are available on YouTube should also be integrated directly into YouTube Music. So if my favorite band appears on a talk show and the clip is put on the internet, I can watch it immediately on YouTube Music. That makes YouTube Music’s catalog hard to beat in terms of its up-to-dateness. 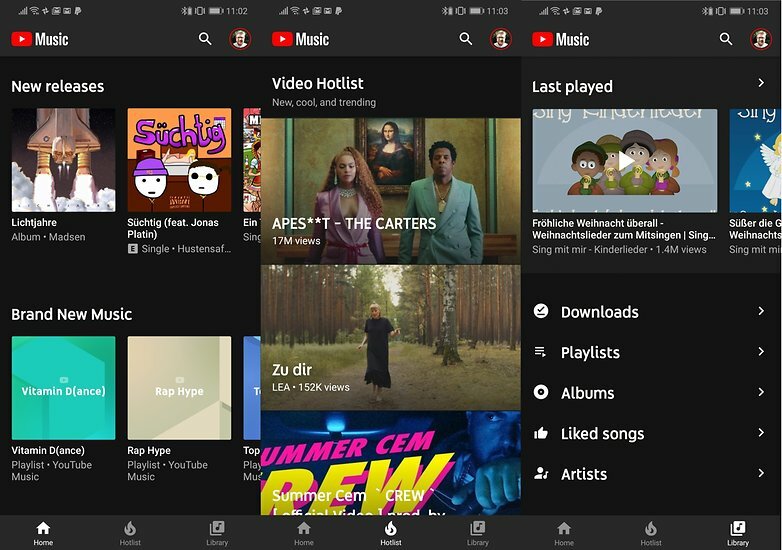 YouTube music is coinciding with the launch of YouTube Premium, the former YouTube Red. You can finally watch YouTube videos without advertising and can even download them if you want! It costs an extra two dollars per month compared to the standard YouTube Music service, but it’s worth it. Which streaming service is your daily companion?